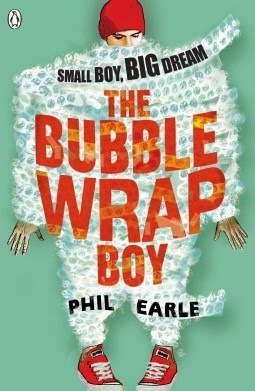 I absolutely adored The Bubble Wrap Boy by Phil Earle. I thought it was fun, funny and also really emotional and heart-wrenching. I've been a fan of Phil Earle's right from the beginning and even aimed at a slightly younger audience and with less edgy content, this is still an incredible book filled with characters and relationships that I really connected to on an emotional level. I started this book, I have to admit, a little bit unsure. The other three books I'd read by Phil Earle have all been favourites of mine and they've all been pretty serious and emotional books. And I heard this book was meant to be more funny rather than edgy and I was feeling less confident in this change of direction. I was silly to worry. Because the same beautiful writing style and great voice that accompanied the author's previous books is still present and shining throughout The Bubble Wrap Boy. This is Charlie Han's story, this small teenage boy who is a bit clumsy and kind of an outsider who is slightly smothered by his well-meaning but over-protective mother. Charlie's mother is a character who at first seemed really over the top and kind of a caricature of a mother and I really couldn't help but laugh at the extreme lengths she goes towards keeping her child safe, especially at the humiliation of her son. The scene where Charlie is delivering takeaway on a trike wearing every protective gear possible including being lit up in neon in broad daylight actually made me roar with laughter. But it isn't until a rather horrible scene occurs between Charlie and his classmates that I fully began to realise how awful it really must be to be in Charlie's position. It's just that he took it all in such a positive way towards the beginning of the story that had me fooled. But despite being small in stature, Charlie has a big heart. And while he knows his mother wouldn't approve and that his dad won't stand up to his mother for him, Charlie starts pursuing his dream of being a talented skateboarder. I really loved Charlie as a character. I love how hopeful and positive he is about everything that gets thrown at him and I especially loved his best friend, Sinus, who along with his big nose carries around some pretty special secrets of his own. This book was really very good. I loved how much the book is about friendship (Charlie and Sinus are the best!) and about family. It's also about not worrying about what other people think and doing your own thing and I loved seeing Charlie grow in confidence and into himself. I really loved the realisations that he comes to about himself and his family and his friendships. Besides that, he just made me laugh! The Bubble Wrap Boy by Phil Earle is another winner! Highly recommended from me. Sounds lovely - I'll be keeping an eye out for it! I haven't heard of this one before but I'll be keeping an eye open for it now!